The time for Thanksgiving dinner preparation has passed, and it's highly likely that the leftovers from the gluttonous day are gone or nearly so. It's now time to shift our focus toward decorating the house for Christmas, buying gifts for family and friends, and thinking about what to serve at holiday parties and at Christmas dinner. When I was growing up, the first couple of weeks following Thanksgiving were filled with afternoons and weekends of cookie baking. While my mother wasn't the best of cooks, she certainly loved to bake Christmas cookies, and every year, we'd decide which cookies we were going to make, how many batches we wanted, and which treats would wind up on the plates we'd give to neighbors and friends. I must admit, I'm feeling pretty nostalgic these days. If you engage in cookie swaps right before Christmas (or if you love to bake cookies, in general), then I have some exciting news! 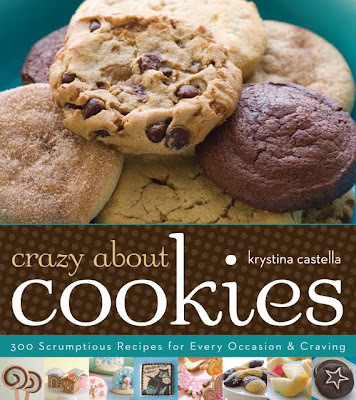 I'll be giving away a copy of Krystina Castella's latest cookbook Crazy About Cookies to one lucky Taste As You Go reader! Despite what it says on the cover, the cookbook contains more than 350 mouthwatering cookie recipes (with variations) for every occasion. Krystina even includes two separate chapters containing recipes for holiday cookies. Cookies for Jewish holidays can be found in Chapter 5, while the entirety of Chapter 6 is devoted to Christmas cookies! Follow @tasteasyougo on Twitter and tweet the following: "I just entered to win a copy of 'Crazy About Cookies' from @tasteasyougo! Click here: http://bit.ly/ebHBq4". Then come back to this post and leave an additional comment with your Twitter username. This giveaway will end in ONE DAY! Entries will only be accepted until 11:59pm EST on Tuesday, November 30, 2010. I'll be randomly selecting and announcing the winner on Wednesday, December 1, 2010. Only readers in US and Canada are eligible to win. Taste As You Go Disclaimer: I was provided with the opportunity to read/review this book at no cost to me. I do not accept monetary compensation for writing about my experiences or my thoughts. All opinions expressed are my own. -- The giveaway prize provided courtesy of Sterling Publishing.